St. Lucia is the world´s only country named after a woman (Lucia of Syracuse). The Caribbean island has an area of 616 km² (238 mi²) and is home to about 170,000 inhabitants. Ninety percent have African roots and mostly came to the island through slavery. It was only in 1979, that the island became independent and a member of the Commonwealth of Nations. The island’s export hits include bananas, flour and rice. The yellow fruits, however, have declined sharply as export goods and have been replaced by tourism as a source of income. Around 70% of the gross domestic product are from tourism. This branch is a huge part of the economic power of the island and continues to grow. In 2017, Saint Lucia recorded a very glorious year for the tourism industry and welcomed more than 1 million guests on the island. The reason for the countless tourists is the nature and the pleasant temperatures, that stay between 28 and 32 degrees Celsius (around 86 F) all year round. Since there are hardly any historic buildings due to many fires, the landscape and wildlife serves as the largest attraction in the area. The most famous tourist destination of the island are probably the Twin Pitons. They are located in a nature reserve and listed as a UNESCO World Heritage Site. The two volcanic cores Gros- and Petit-Piton protrude from the water at a height of 798 or 750 meters (2618 & 2460 ft) and consist of solidified lava. They are surrounded by a species-rich rain forest and a marine area with coral reefs. St. Lucia is also home to the world’s only navigable volcano. The sight can be reached via the city of Soufriere and allows you to drive through a barren, stinking lunar landscape. Unfortunately, we did not have enough time, as we were curious about the beaches and wanted to enjoy the warmth. By the way: During the early 1990s, less and less fish was caught on Saint Lucia. Therefore, fishermen, the tourism industry and environmentalists agreed on a solution and set up water conservation areas around the island. Since then, about a third of the coral reefs around are under complete protection and there is no fishing, swimming nor diving. Other places are under easier protection and are open to divers and swimmers. Since the formation of these areas, the number of fish around Saint Lucia has multiplied. Why am I writing this? Because it is the best thing about island life: People pay attention to sustainability and live by it. 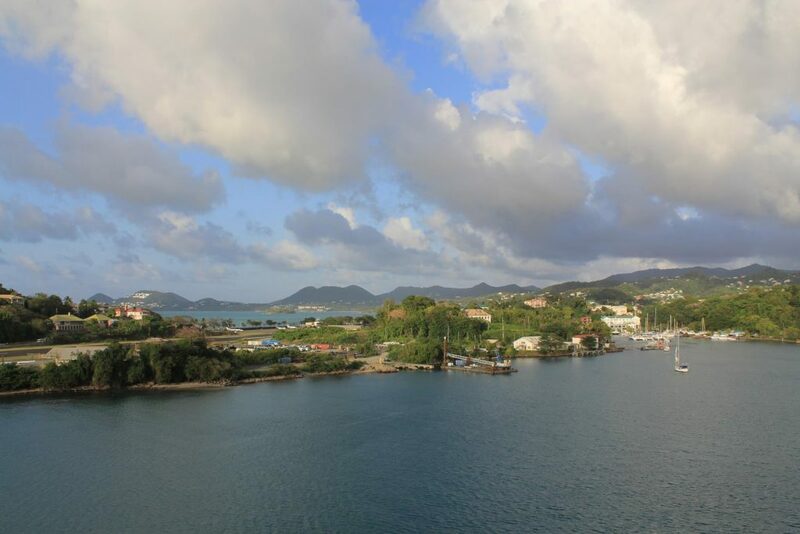 After our visit to Saint Lucia, we docked in St. Kitts and Nevis the next morning. Therefore, the next post will be about St. Kitts.